Normalment l-attivitajiet ta’ Lorna Vassallo jsiru dejjem ġewwa Soreda Hotel, il-Qawra. Dejjem jiġi pprovdut trasport b’xejn u parkeġġ b’xejn huwa wkoll pprovdut skont id-disponibbiltà taħt il-lukanda għal dawk li jixtiequ jużaw it-trasport tagħhom. 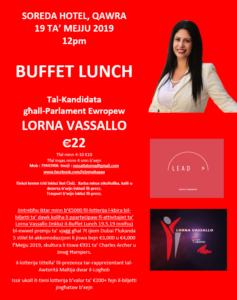 Usually, all Lorna Vassallo’s activities take place at Soreda Hotel, Qawra. Free transport is always provided and free parking is also provided according to availability underneath the hotel for those who have their own transport. Ma’ kull mejda ta’ sitt adulti li tibbukkjaw u li tħallsu qabel id-data ta’ Sunday Lunches u Buffet Dinners, min iħallas jieħu vawċer tal-għażla tiegħu tal-valur ta’ madwar €20 b’xejn. Vawċers jikkonsistu f’vawċers tal-ikel, affarijiet tal-iskola, servizz ta’ taxi, beautician, hairdressers, kejkijiet u rigali oħra. With every table of six adults that is paid before the date of the event, in case of Sunday Lunches and Buffet Dinners, whoever pays is entitled to a voucher of his/her own choice of a value of around €20. Vouchers can vary from restaurant vouchers, school items, taxi services, beauticians and hairdressing services, cakes as well as other types of vouchers. Ħlasijiet isiru b’Paypal, ċekk, bank transfer jew flus kontanti Mġarr, Mellieħa, Qawra, Birżebbugia jew Belt Valletta. Min ma jħallasx bi flus normalment jiġbor il-biljetti mal-bieb dakinhar tal-attività. Payments are to be made by means of Paypal, cheque, bank transfer or cash in Mġarr, Mellieħa, Qawra, Birżebbugia or Valletta. Whoever does not pay cash, normally picks up his/her tickets at the door on the day of the activity. Ċempel fuq 79443906 għall-informazzjoni sħiħa. Phone on 79443906 for all details.